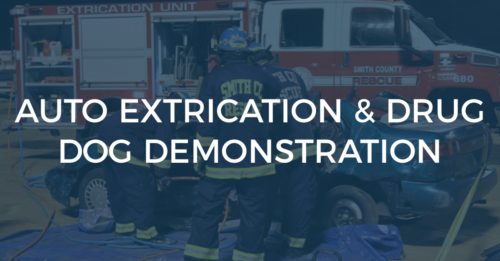 The Smith County Rescue Squad and the Smith County Sheriffs Department will perform two Auto Extrication and Drug Dog Demonstrations in the Russell Nixon Arena at 6:00 p.m. and 7:00 p.m. on Monday, July 2, 2018. The auto extrication will be done by the Smith County Rescue Squad, and the drug dog demonstration will be performed by Officer Ridge Long and K9 Officer Constance. This program will emphasize the importance of seatbelt safety and the hazards of texting and driving.